The windswept islands of the Aegean are but only the highest peaks of a land mass that in the distant past connected southeastern Europe and western Asia and included the whole of what is today Greece, the Aegean Sea, western Asia Minor and Cyprus. The submersion of this area began four million years ago. The southeastern section of the Aegeid became flooded by the sea, thus creating the azure Aegean Sea. Above the surface of the water remained only the highest sections of the mountain ranges—the islands of the Aegean. In the central and southern Aegean, between the Peloponnese and the Dodecanese islands, there is an island group made of 30 larger, inhabited islands and approximately 190 islets. The Ancient Greeks called these islands the Cyclades and they believed that Delos—the great religious centre of antiquity—constituted their centre. In 1210, the Venetians named this area ‘Arcipelago’, from the Greek words ‘archi-‘ [a prefix of many words, derived from the verb ‘archo’, which means ‘to lead’ or ‘to be supreme, or chief’ and ‘pelagos’ (sea)]. Embraced by the deep blue waters of the Myrtoan Sea to the west, the Cretan Sea to the south, the Icarian Sea to the east and the Carpathian Sea to the southeast, the Cyclades—the islands of the Aegean Sea sun—lie scattered upon a marine area covering 8,000 square kilometres. Located in their centre, between Naxos and Sifnos, is the island group of Paros and Antiparos, two islands with impressive landscapes and a rich history. From the capital of Paros, the beautiful Paroikia, the road towards the west—which leads to Alyki—forks, and one of its branches leads to the traditional village of Pounta. From its little bay, one can admire across the way almost the entire northern coast of Antiparos and the whitewashed little houses of the sole village of the island, named Antiparos or Kastro. This was the easiest way to get to Antiparos in the old days, as well. ‘If you open wide the door of the little chapel in Paros’ Pounta, you’ve made it to Antiparos...’ the older ones still say, as Antipariot caique boatmen who would see the open door of the chapel knew—in accordance with this ancient custom—that someone was waiting for them in order to be taken to the other side. Antiparos, the ancient Oliaros, one of the smallest inhabited Cycladic islands, extends very close to the southwestern shores of Paros—from which it is separated by the Steno [narrow] of Antiparos, with a width of 500 to 1,000 metres and a depth of 4.5 metres—and lies to the east of Sifnos, at a distance of 13 nautical miles from the latter’s easternmost cape, Napos. Antiparos is surrounded by a group of uninhabited islets. The most significant of these are Despotiko, Stroggylo, Diplo and Kavouras.  Antiparos has an oblong, irregular shape, and terminates at two points (tips): Cape Voreino in the north and Cape Petalida, in the south. The length between these two points is 12.5 kilometres and the maximum width of the island is 5.5 kilometres. Its area is approximately 35 square kilometres and the length of its coastline is 57 kilometres. In terms of physical geography, the island is divided into two parts: The gentler and more hospitable northern section, and the rocky and wild central and southern areas. The village of Antiparos is built upon almost half of the northern section. To its southeast, precisely behind the astounding sandy beach of Psaralyki, a small area the size of a football field is flooded each winter by the sea, forming a shallow little lake. In summer, the pond dries up and is transformed into a white—as though snow-covered—area, a natural saltern. Strange, ‘unassuming’ plants called halophytes—the sole plants that can develop in salty soil such as this—pop up here and there. To the south, the terrain is hilly, dominated by two elevations—Stavros (elevation 136m) and Prophitis Ilias (133m). Further south, a lowland area known as Kambos stretches out, separating the northern section from the remainder of the island. The rest of Antiparos is barren and wild, with massive, craggy elevations. The most important mountainous mass is another Prophitis Ilias—located approximately in the middle of the island—and this also occupies the greater part of this section of the island. The peak of the same name, to be found at what is approximately the geographic centre of the island, reigns supreme, the highest point on the island (299m). Various high ridges extend westwardly from this central core, reaching as far as the coast. 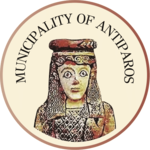 Antiparos is supplied with water mainly through wells, while surface waters are encountered only in the form of torrents. However, inhabitants have diligently tilled as much cultivable land as there is on their island, managing to transform the northern section of Antiparos, in the main, into a fertile field. They cultivate cereals and vines mostly, as well as fruit, such as fig trees, lemon trees and orange trees. They are also involved in raising livestock, breeding goats and sheep, and in fact use the islet of Diplo— and even more so that of Despotiko—as pasture lands. Another—and more important —sector of the Antiparos economy is fisheries. The waters off Antiparos constitute the most significant octopus ground in the Cyclades, and sun-dried, grilled octopus is a choice ‘mezes’ [appetizer, tidbit] for ouzo, served at the little ‘tavernas’ [traditional food taverns] of Kastro. Despite its ancient name ‘Oliaros’, which means ‘foresty’, Antiparos today is essential bare and its natural vegetation is composed of wildflowers and brushwood, such as thymes and brushy cypresses. Only in a few areas does one encounter some cedar trees and lentisks, as well as a few tamarisks, remnants of the dense vegetation that covered the island in the past. Antiparos is also widely known for its wild rabbits and wild pigeons. From Kastro, one can circumnavigate the island in a caique and get to know many small and deserted beaches that reveal the geological history of the island. The rock formations that make up Antiparos—and many of the Cycladic islands—belong to all three categories of rock as discerned by geologists; that is, there are volcanic, sedimentary and metamorphic rock formations. Sedimentary and metamorphic rock formations—such as limestone, thin-schist gneiss with greenish mica and crystalline-schist shale—prevail in the central section and along the ridges of the elevated areas of the island. The southern section of Antiparos, Despotiko and Stroggylo are composed of acidic lava and small quantities of volcanic tuff, perlite, obsidian and other rocks and minerals. A part of the northern section of the island, a part of Diplo, as well as the Spyridonissia are also composed of acidic volcanic formations. In fact, the whole of the area of Antiparos is part of the South Aegean Volcanic Arc, which has experienced intense activity, even in the modern era. The mineral wealth of Antiparos is significant. Initially, a limonite deposit was discovered on the western slopes of Prophitis Ilias, from which iron was extracted, with pockets of smithsonite, from which zinc was extracted. Mining activity on the island began in 1873, when the state ceded the exploitation rights to these deposits to the Elliniki Metalleftiki Etaireia [Hellenic Mining Company], which began mining iron ore [calamine] in the area of Kaki Skala. The Galliki Etaireia Lavriou [French Company of Lavrio] took over the mines in 1890 and erected significant installations and facilities on Antiparos, including buildings, offices and machinery, as well as a railroad for the transport of the ore as far as the coast. From 1902 until 1920, some 45,894 tonnes of ore were extracted from the mines of Antiparos. The last mining activity on the island—which involved the extraction of lead—took place during the years 1952-1956. The now defunct mines are testament to the mining activity on the island; the list includes the iron mines at Hatzovouni and Batayes, mercury mines at Kaki Skala and San Pieros, lead at Varvarossa, Prassovouni and Tsombanarou, lead at Ayios Yeorgios and Renieri, and manganese at Magganies.